I've been killing myself off over the last few weeks trying to get the backyard landscaping done, get a greenhouse setup and do the regular pumpkin patch prep you do each spring. I'm pretty excited about it all and hope I get it all done. First, the low tech updates. For the south patch, I've added a 4 foot tall wind screen on the south side of the patch. Here winds only blow from the north and south and the south winds are usually strongest. It is windy about 90% of the growing days, so this wind screen will help. I've also added 6 sprinkler heads to that patch. A nice improvement over the single head on a hose that I moved around the patch manually. I'll get much better coverage now because water will hit from multiple directions. The tech stuff is being done in the north patch. 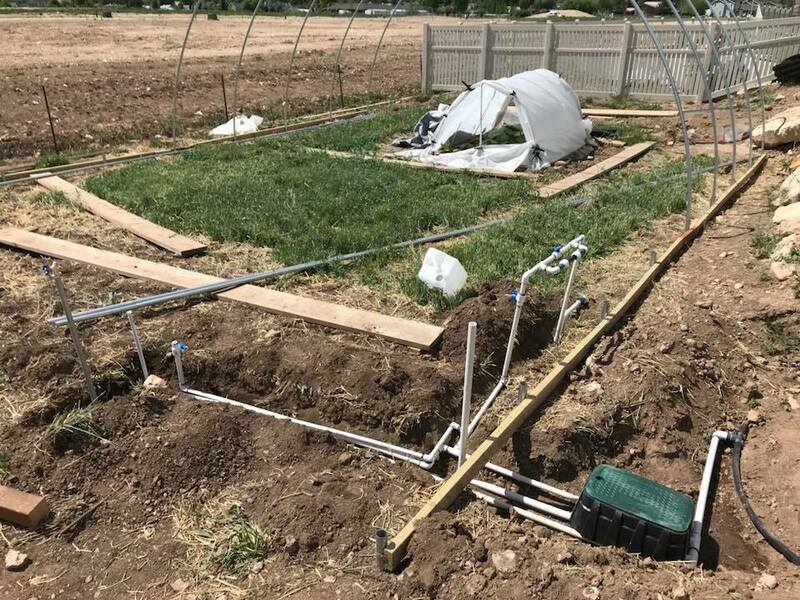 The greenhouse and geothermal heating and cooling system I've talked about previously. In the greenhouse I'll have an Acurite wireless temperature gauge. Same kind you use to check outdoor temperatures at the house. I've connected the data for that to weatherbug.com (easy to do). Weatherbug.com has an API. So I'll connect into that data on a website to decide when to do things in the greenhouse. So, for example, I'll have a simple fan (free cheap one) like you would get at Walmart that we were given) at the top of greenhouse that will be set to turn on anytime after 10:00am but before 8:30pm if the temperature is over a set amount. The geothermal fan ($40 ebay) will be set to turn on if it is after 1:00 or before 4:00 if the temperature is above a certain amount. This will pull heat into the soil and blow cooler air out the other end. And it will be set to turn on after 1:00am but before 7:00am if the temperature is below a certain amount. This will blow the heated air out at night. The coding for this is more complicated if you don't know coding, but if you own a website design business it is relatively easy. The on off switch will be done by an outdoor wifi enabled smart plug ($30). Using its API the two fans will be turned on and off. I'm also adding mister foggers ($50 dripworks.com) to help cool the plants during the heat of the day. These will be connected to a valve that will also be controlled in the same way as the other devices, with misters getting turned on every 15 minutes or so during 10:30am and 5:30pm when the temps are above 86 degrees. Last change is that irrigation for the north patch. For the watering I'll have my old Daan micro sprinklers watering under the canopy. That is hooked into a portable camping water heater ($120 on sale at Amazon) and then that goes into a fertigation siphon ($15 ebay). So basically I hope to warm the water to 80 degrees. The watering will get turned on at about 5:00am which is right before the lowest of the nighttime lows. That will not only water the plants, but will get the biology in the soil going and heat up the greenhouse. The fertigation will allow me to constantly add low levels of fertilizer to the plants constantly. That way the plant will be constantly pushed and never in need. My hope is that with these changes I can better control the environment and get greater gains for longer during the growing season.